Philadelphia Eagles quarterbacks Carson Wentz and Nick Foles during minicamp at the NovaCare Complex. If you're hoping this story ends with Eagles head coach Doug Pederson revealing his starter for Week 1 against the Falcons, prepare to be disappointed. With half of the preseason schedule in the books, and just a few weeks remaining before the regular season opener, the Birds seem no closer to naming a starting quarterback. On Sunday, both Carson Wentz and Nick Foles were back at practice, participating in 11-on-11 drills. For Wentz, who is still recovering from a torn ACL, this marked the first time since late July that the 25-year-old took place in full-team drills. "It's big. It's big to evaluate him and see where he's at and get him back in there with the guys," said Pederson. "Again, it's still a slow process but, at the same time, it's exciting for him. And for us, to get him back out there." Wentz's return, however, was not without limitations. He and Foles, who left Thursday's preseason loss to the Patriots with a right shoulder strain, split the first-team reps, meaning each only took on about 50 percent of the normal practice workload. Still, it was a positive sign for both — however, it was the following answer from Pederson that suggests Wentz may be closer to a Week 1 return than previously indicated. "I want to make sure that [Wentz] is with the starters," Pederson said when asked about having Wentz run with the first team, "so that when he is finally OK to play, he's still got the timing with the starters." The last hurdle Wentz needs to clear before returning to game action is being medically cleared for contact. And according to Pederson, even if that clearance comes before the final preseason game, he's "probably not" going to play him anyway. "We're not there yet obviously," he added, "but we're just going to take it day-by-day right now." 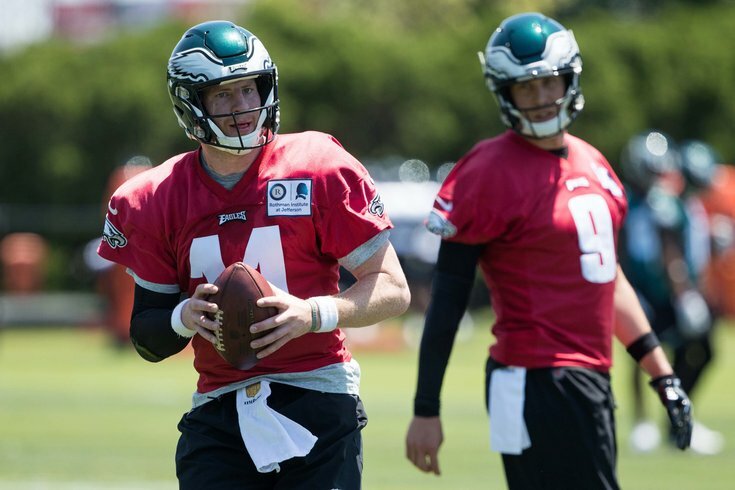 Just because Wentz hasn't been fully participating in practice, however, doesn't mean that the Eagles haven't been constantly monitoring their quarterback's progress — and not just the progress of his surgically repaired knee, either. And they like what they've seen. "Just overall, his health, the strength of his knee, where he's at physically. His arm is live — he hasn't had all the reps, obviously, that Nick [Foles] has had, that Nate [Sudfeld] has had, so his arm is live. He's fresh, and that's all the things that we kind of wanted. It's where we wanted him to be at this stage." As for the season opener, Pederson seems fine not knowing who his starting quarterback is going to be, despite their somewhat different skillsets. "When we look at our schedule and look at who we're playing early in the season, we look at scheme defensively, from an offensive perspective, and conceptually what we feel are going to be plays we can execute," Pederson said. "I don't worry about the quarterback position at this time as much as just understanding the defense that we're going to see." Could this actually play to the Birds' advantage against the Falcons? "I think so, but again, it's not Kevin Kolb and Mike Vick, you know what I mean?" Pederson added. "In this case, I think it's very similar. But at the same time, I think it doesn't hurt to, you know, not put out there who is going to start right away." But why now? Why put their franchise quarterback in harms when they seemed so content on avoiding just that. Was there a development with Wentz that would suggest his at a lower risk of re-injury? Nope. It's all still part of the plan, according to Pederson. "Again, go back to the beginning of camp and some of the things I had mentioned earlier. It's all part of what the doctors have said," the third-year head coach said. "They're the ones who evaluate the knee; I can't do that. My expertise only goes so far, but what I can tell you is that his arm is live, he's moving around well for the quarterback position, and he's excited to get out there today."